A small plane crashes deep in the Venezuelan jungle. A family fleeing the post-WWII nightmare of occupied Germany is captured by a warlike tribe living far from civilization. Fortunately for the blonde-haired newcomers the Indians believe they are magical river dolphins who have taken human form. Can the stranded Germans keep up the pretense? Or will they be discovered, cast out or killed? A full-on survival story set in Venezuela's Amazonas region, Torsten Krol's debut novel "The Dolphin People" reinvents the Boys Own adventure yarn for a 21st century audience with some tongue-in-cheek twists that will have you laughing out loud or squirming in your seat. The book starts with German teen Erich and his younger brother Zeppi leaving behind the ashes of a defeated Fatherland and setting sail for a new life in South America with their widowed mother Helga. It's 1946 and Helga has agreed to marry her dead husband's brother Klaus, a doctor who has settled in southern Venezuela. After a brief marriage in Ciudad Bolivar, Klaus takes his new family to the airport where they board a plane to a remote jungle camp. Flying into a storm over heavy jungle, the plane is buffeted by heavy winds and rain before crashing into a river, leaving Klaus, Erich, Zeppi and Helga cold, wet, lost and stranded, without food, shelter or hope of rescue. The only thing Erich has managed to cling onto is the Iron Cross his dead father received from Adolf Hitler. The family's adventure begins in earnest when Erich meets a group of naked men in the jungle, hunters from the Yayomi tribe, who believe these strange white people washed up on the river bank are mythical dolphin spirits in human form. Before it is over, one unfortunate bather will be stripped to the bone by a frenzied school of razor-toothed piranhas, another will have experienced the excruciating pain of being entered by the insidious "willy fish", or candiru, and Erich will have grown from an innocent boy brought up with the certainties of Nazi Germany to a young man ready to fight for his survival. In the meantime, Krol paints a caricatured but convincing portrait of his fictional Yayomi tribe, clearly based on the Yanomami given the specifics of their unique funeral ritual of eating the bones of the dead crushed into plantain soup. By pitting Nazis against the Yayomi, Krol has created a novel that works on many levels. On the one hand it can be enjoyed as a traditional jungle adventure, but it can also be read as a critique of the "savage", "stone age" label so often applied when describing rainforest peoples. Who are the savages here? The Yayomi, living in harmony with their environment, or the Nazi doctor Klaus, representing an ideology that engulfed the world in a brutal world war and justified the murder of 6 million men women and children because of their religion. Klaus's certainty of his own racial superiority over the Yayomi rings especially hollow, knowing what we do of the Holocaust and the death camps. This fast-paced page turner is a strong debut for Krol, who is better known for his second novel Callisto, a satirical sideswipe at Islamaphobia in the USA. The author is something of a mystery himself. The publisher refuses to grant interviews with him, saying only that Krol is a reclusive Australian writer living in Queensland. However, there has been speculation in the Australian press that he - or she - is an established author writing under a pseudonym. From the Daily Telegraph - "50 of the Best Holiday Reads"
"Could this be the new Life of Pi? 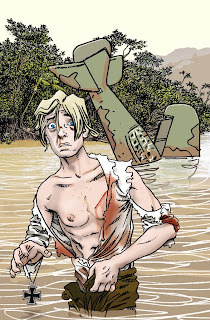 The Dolphin People is a madcap South American adventure story in the tradition of Robinson Crusoe, by the cult author Torsten Krol. A German widow and her two sons set sail for a new life in Venezuela, but become stranded with the stone-age Yayomi people, who fête them as reincarnated dolphin-gods. Unputdownable." Adding it to the read pile! Thanks Russell! Just read the Dolphin People and it's amazing, inspirational and a bit scary. They should make a movie of it. Maybe Robert Rodriguez would do it justice as director. Torsten Krol clearly has a great sense of humour and his tongue in his cheek, but that doesn't mean he is disrespectful to the Yanomami Indians. Too many authors of factual works, anthropology or travel books slip immediately into that stereotype of the Yanomami as fierce primitive savages living a Stone Age existence. They are not. They are in fact the victims of Western expansion into their lands by missionaries, miners, anthropologists and the army. Not to mention politicians seeking votes. All of them are happy to exploit the yanomami in their own ways without giving them anything meaningful in return. Putting Nazis into the jungle was an inspired move. Loved it. Thanks!!! This book is nothing like the banned horror movie Cannibal Holocaust, which was shot in Venezuela in the early 1980s and which trashes the Yanomami completely, showing a totally erroneous depiction of the tribe. Krol at least has a sense of humour and sticks to the facts, although he clearly exaggerates for the sake of the story... but no way does this book resemble Cannibal Holocaust in any way, shape or form. Directed by Ruggero Deodato, Cannibal Holocaust - banned in 53 countries - is without doubt the most gruesom horror movie of all time, a really realistic jungle shocker full of gratuitous scenes of real life animal cruelty - but in terms of Venezuelan anthropology it's a crime against the indigenous groups it misrepresents. Voy a ver si puedo comprar el libro en Caracas. Gracias por los tips. Que bueno tu blog. Nazis en la selva amazonica de Venezuela? No puede ser. K riza me da... K fino!